I think the newests sets have humans and orcs, including a huge troll. Also, if you want some elementals, check their whole mining series. Lego coolness, I've still got some of my pieces from the Yellow Castle set I had as a kid. I wish I had picked up the Vikings, Dwarves and "Orcs" that were released a few years ago. Woa, the Yellow Castle? That is super old. Somewhere on the web I saw a video of some guys that recreated the Yellow Castle at 110% size. They made each big piece with a grouping of little Lego blocks. The final castle was big enough to crawl inside. Are the orc/troll sets still around? I went to a couple toy stores last week, and all I saw were Atlantis sets, Star Wars, etc. Try the websides for the big stores like Walmart, Toys R Us, Target etc. A lot of times they have rotated their shelf stock but still have access to the older sets. I still have some Lego parts around as well, though I only had a handfull of the knight-sets. 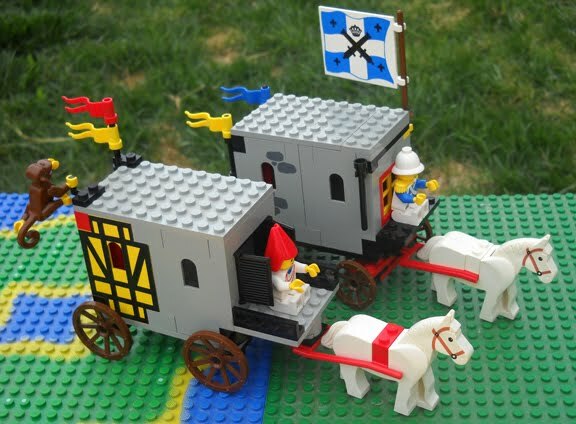 I think I had (still have, somewhere) the first castle, the blacksmith and a wagon. The King's Castle, if that's the original one, is worth a good bit these days, especially if you still had the original box. I still have my old Lego sets, though like yours the parts are scattered all through other things. For medievals, I had the siege tower set, plus a few stray figures from yard sales. Most of mine were the space sets. I went through one phase where I used to build Civil War ships out of the Lego bricks. There were never enough of the rotating bricks for the turrets, though. Did you ever have the old "Lego Wars" skirmish rules that were written for wargaming with minifigs? I do have the box and instructions, but the pieces are scattered. I don't have the Lego Skirmish rules, but I am aware of them. When I was a kid my grandmother bought some yard sale Legos. They must have been really old because the minifigs had no face painted on, and their legs didn't move. Just a little update on the castles: In Germany, "Lego Kingdoms" is still sold, that means castles and some fantasy creatures. The line is still running and advertised over here, even with new sets.